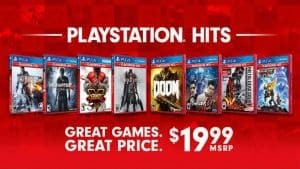 PlayStation Hits Discounted Games Line Announced | Nerd Much? Sony has announced a new value tier of games coming to the PlayStation 4. The company is calling the new collection PlayStation Hits, with the line debuting with 15 games selling at a mere $19.99 each. There’s some real heavy hitters amongst the games chosen to premiere in the PlayStation Hits collection. Perhaps most notable amongst them are the Naughty Dog duo of Uncharted 4: A Thief’s End and The Last of Us Remastered. I noticed that Uncharted: The Nathan Drake Collection wasn’t included, but then saw that the collection is already listed at $19.99 at various retailers. The other games in the collection consist of the following: Bloodborne, Driveclub, Infamous Second Son, Killzone Shadow Fall, Little Big Planet 3, Ratchet & Clank, Battlefield 4, Doom, Project Cars, Street Fighter V, Yakuza 0, Yakuza Kiwami and Metal Gear Solid 5 The Definitive Edition. At retail, the games will feature a red case with a bright red banner towards the top designating the game as a PlayStation Hits title. The various games will also be purchasable at the PlayStation Hits discounted price on the PlayStation Store. The program is launching as of June 28th in the U.S. and Canada. However, Doom is excluded from the program in Canada for some reason. Sony says that they will “continue to add to the PlayStation Hits lineup” further down the line. So if you’re holding out for other titles to get a discount you’re not completely out of luck, but you’ll likely be waiting a while. The list of games debuting as PlayStation Hits is a nice mix of both 1st party and 3rd party offerings on the PlayStation 4. It’s evident that you don’t have to be within the Sony umbrella to be included, which bodes well for an ever expanding list of titles going forward. 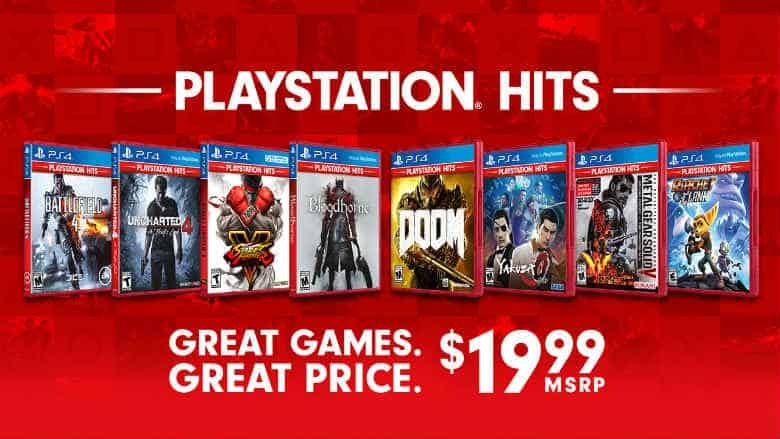 There’s no better time to hop in and enjoy some fantastic games now listing at a great price. Who wants to spend the summer outside anyway?